U.S. women's bobsled teammates Elana Meyers Taylor and Lauren Gibbs make a run during training at the 2018 Winter Olympics. Riding a bobsled is not for the faint of heart. The instant the bobsled shoots down the iced track, the world will narrow into a white tunnel of ice. The sled will rocket around hairpin turns so sharp the sled tilts sideways and your head dangles out, a few inches away from the ice. The wind will lash your face, and your ears will be filled with the sound of metal runners scraping ice. You will rattle around like a dried bean in a metal bowl. "Bobsledding is like sprinting with NASCAR," said Elana Meyers Taylor, 33, the senior-most member of the U.S. women's Olympic bobsled team. "You get to push these 400-pound sleds as fast as you can, down a hill, and hop in. How could you not enjoy that?" Meyers Taylor is a solid wall of muscle, and she looks like she could take a bobsled outside and show it who's boss. She has good reason to be confident. Meyers Taylor is ranked No. 2 in the world in women's bobsled and is a two-time medalist back for her third Olympics. 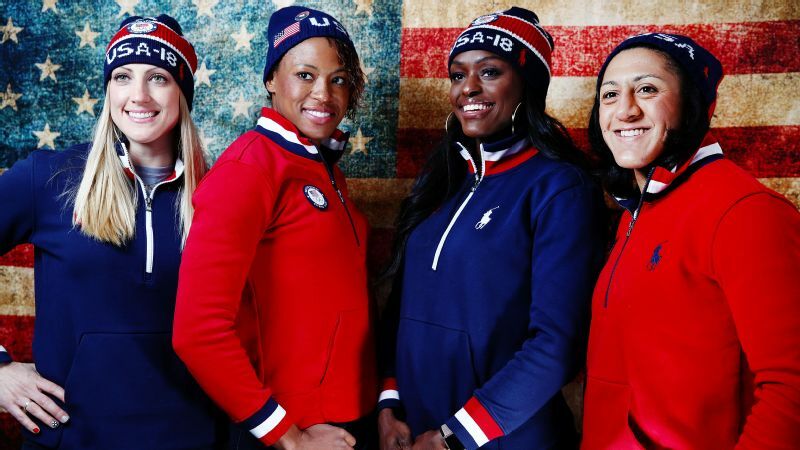 Since 2002, when women's bobsledding first became an Olympic sport, the U.S. women's team has brought home medals every Olympics. The team has made a name for itself for fostering diversity, as well as excellence: Four of the five team members are women of color. This year's team consists of two pairs: pilot Jamie Greubel Poser and brakeman Aja Evans, who teamed up to win a bronze at Sochi. Then there's Lauren Gibbs, who left her six-figure-salary sales job to pursue her Olympic dreams, serving as brakeman for Meyers Taylor. Finally, rounding out the pack is alternate Briauna Jones, a brakeman who started the sport two years ago. 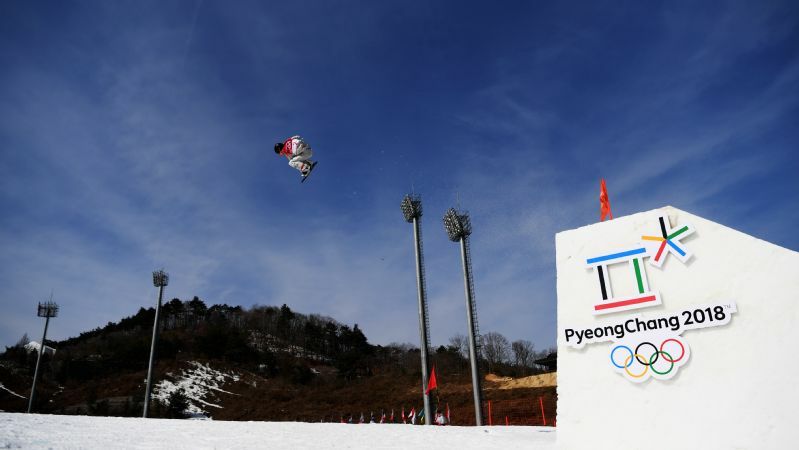 For all of them, the trek to Pyeongchang started long before this year, a ride full of ups and downs and hairpin turns. 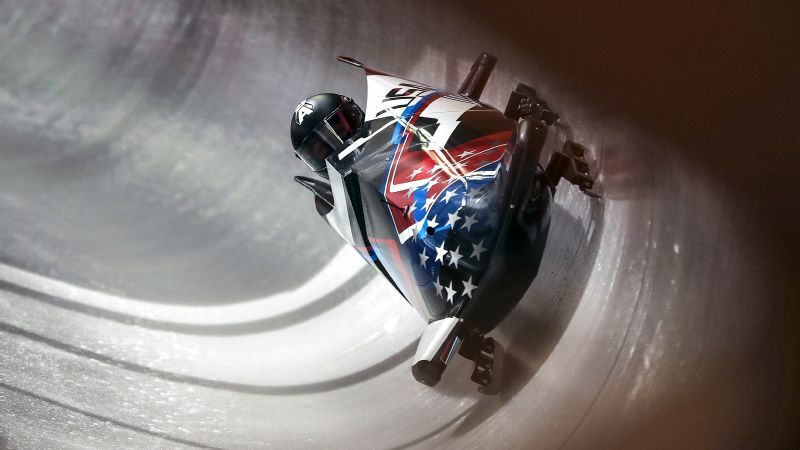 To begin with, there's bobsledding itself -- low-profile, underfunded and brutal. Men's bobsled has two events: four-man and two-man. Women are limited to a two-person bobsled. In two-person bobsled, a pilot and a brakeman push the bobsled down the first 50 meters (164 feet) of an iced track. Then, the pilot jumps in over the side and the brakeman leaps into the back of the sled. They zoom down the track, which is about a mile long, the pilot steering around zigzags. The ride itself is a bone-rattling roller coaster that can go up to 90 miles per hour with up to 5g of force pulverizing the flesh. The best drivers can steer the sled down the most efficient path to arrive at the fastest time. In bobsled, races and dreams are won and lost by tenths of a second. During competition, drivers are given only six practice runs down a track, which translates to roughly six minutes of practice before they compete. Even the best drivers crash regularly, and pilots drive knowing the safety of their teammates lies in their hands. "It's the one sport where you get mentally and physically abused if you make a mistake," driver Greubel Poser said. The U.S. women's bobsled team is made up of, left to right, Jamie Greubel Poser, Lauren Gibbs, Aja Evans and Elana Meyers Taylor. Even for those who can stomach the ride, training isn't easy to come by. There are only 16 bobsled tracks in the world, and two in the United States: Lake Placid, New York, and Park City, Utah. Most athletes come to bobsled as adults. They come because they yearn for an athletic career or because they ran out of opportunities in their original sport. Several have track and field backgrounds, as bobsled rewards athletes who are strong and fast. As an athlete at Cornell University, Greubel Poser, 34, competed in heptathlon and pentathlon, in which she broke multiple records, and was inducted into the Cornell Athletic Hall of Fame. She knew she wanted to be a professional athlete. When a former teammate from Cornell mentioned bobsledding, she went for it as a brakeman, but she never saw herself as an Olympian until she missed out on making the 2010 Winter Games. Inspired after almost making the Olympics, Greubel Poser switched to being a pilot, and four years later won her first Olympic medal at the Sochi Games. Now she's ranked fourth in the world, one of the top two pilots on Team USA. "My first time on a bobsled, I hated it. I was terrified. I never thought I would come back, and here I am 10 years later and I've had an amazing career," she said. "I want to inspire kids, especially female athletes, to pursue their dreams and to try new things." In women's bobsled, the top two countries get to enter three sleds in the Olympics, and the next four countries get two. This means the top two drivers (Meyers Taylor and Greubel Poser) are pretty much guaranteed a spot on the Olympic team. There's a good reason Greubel Poser switched to driving to go to the Olympics: Competition for spots on the Olympic team is particularly stiff for brakemen. This season, Team USA's third pilot, Brittany Reinbolt, missed qualifying a sled by 0.16 seconds. It can take up to four or five years to develop the driving skill to become a good pilot. Being a good brakeman relies mostly on the strength to push the sled and the speed to do it fast. "Bobsledding is like sprinting with NASCAR," says Elana Meyers Taylor, the senior-most member of the women's Olympic bobsled team. Brakemen can rise through the ranks quickly. Every year, there's new competition for a place on the national team. The brakemen selection process is a six-month grind that starts in July when push championships are held. Then, in October, there are national team trials. Brakemen are selected for the national team based on their push championship and team-trial results. But that's just the beginning. The national team goes on to compete in the World Cup from November to January, where a race is held nearly every weekend. During an Olympic year, a selection committee decides which brakemen get to go to the Olympics based on their World Cup performance. This year, six women made the national team as brakemen, vying for two spots on the Olympic team. Coach Brian Shimer groans when he talks about the selection process for the Olympics. "It's a blessing and a curse to have such a talented team." Brakeman Evans said competing against your teammates is one of the hardest parts of bobsled. "One minute you're a team where you are helping each other. Then, at the blink of the eye, we have to block everyone out, and go for blood and compete and take out anyone in our way, even if it's our teammate. It's tough to be that hot and cold." As hard as it was, no one was particularly surprised that Evans, 29, made the team. Her Twitter bio reads: "Look like a beauty.... Train like a beast.." Case in point, her box jump leaves coach Shimer speechless. When bobsledders tend to get worn out by the end of the World Cup season, Evans just kept getting better. Evans, who grew up in Chicago, was a track athlete at University of Illinois. She was trying to qualify for the 2008 Summer Olympics in track and didn't make the team. Her college coach mentioned bobsled, but she brushed off the idea. In 2012, she decided that she needed to be competing again. The 2016 Summer Olympics seemed too far away, so she decided to try bobsled for the 2014 Olympics. She made the Sochi Olympics team and walked away with a bronze medal. 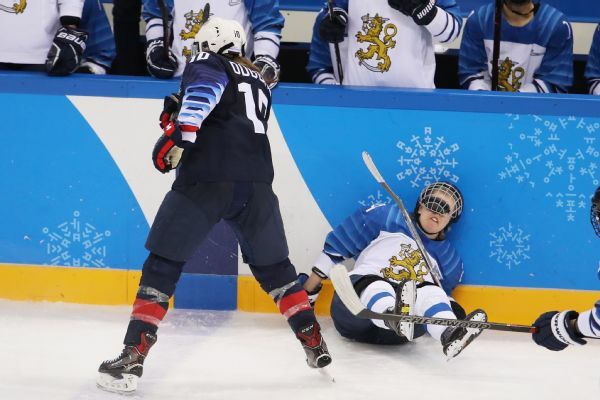 "I don't think we got as much out of her as we could have," Shimer said of Sochi. "Her pure athleticism makes her one of the best in the world. These Games, we're going to see an even better Aja." Bobsled might be empowering, but it's a lifestyle that demands sacrifice. During the World Cup, athletes are on the road every week. Greubel Poser said she spent the first five months of her marriage apart from her husband, German bobsledder Christian Poser, competing. Beyond the personal sacrifices, there's the financial burden. Bobsledding doesn't pay well, especially when new to the sport. The USA bobsledding team receives a third of its funding from the Olympics sports committee, and the rest comes from sponsorships. There have been years when the women's bobsled team qualified three sleds but didn't have enough money to send the third to the Olympics. Once bobsledders make the national team, room, board, training and the cost of competition are covered for a year. (The next year, athletes must compete again to make the national team.) In addition, they earn a stipend. Alternate Jones said her stipend is $500 a month, while stipends max out at $2,000 a month for the top athletes. Athletes can get sponsorships, but sponsors favor the most accomplished athletes. Greubel Poser recalls training and then working eight-hour shifts as a waitress in her early days as a bobsledder before she got to a point where she had sponsorships that allowed her to focus on bobsledding full time. Meanwhile, pilots must rent sleds, which can cost $1,000 per season, and purchase sled runners, which can range from $4,000 to $6,500. All athletes require vests and spiked shoes, which add another $1,000 in expenses. During the offseason, athletes are responsible for their own training. Athletes who made the national team the previous season receive free training, but if they want to train in Canada where there's an indoor ice facility, that can run them an extra $5,000 out of pocket. Brakeman Gibbs says she spent $20,000 of her own funds this summer on training. "I probably spent more than the average because I knew exactly what I needed to get done this summer in order to be the athlete I needed to be to compete for the games," she said. As a child growing up in Los Angeles, Gibbs, 33, would play the Olympics anthem on her mother's record player and march around the living room. However, as she got older, the Olympics seemed to fade into the realm of daydreams. Gibbs played volleyball at Brown University, but at 5-foot-10, she wasn't tall enough to play after college. Instead, she traded sports for an MBA and a job. "It just felt like every morning, I was dressing up in my mom's closet and going to work. It didn't feel authentic. I felt like I was hoping for more, but I didn't know what more meant," Gibbs said. When Gibbs' friend and rugby Olympian Jill Potter saw her working out, Potter suggested Gibbs try out for the U.S. bobsledding team. Gibbs figured she'd never make the team, but decided to give it a shot. She was invited to join the national team for the 2014-15 season with a caveat: lose 20 pounds in a month to make weight limits. Gibbs did it, no questions asked. Today, she sports an eight-pack and her frame is lean and rangy. She gets incoherent and bubbly with excitement whenever she talks about the Olympics. "This is something I always wanted as a kid but didn't think was an option, but to get this chance again later in life, at a time when it was something that wasn't on my radar, is incredibly special. I respect the opportunity. That's what keeps me going," she said. Meyers Taylor is the linchpin of the team. She has recruited several bobsledders to the sport. Her eyes are warm, her smile whimsical and her voice low and confident. Meyers Taylor didn't start with Winter Olympic dreams. As a teen, she thought she'd be a basketball player. But then she stopped growing and switched to softball. She played softball for George Washington University and then professionally for a year. When softball didn't work out, she switched to bobsled and joined the U.S. team in 2008. Two years later, she received a bronze at the Vancouver Games as a brakeman. Shortly after, she switched to being a driver and scored a silver at Sochi. Her hopes for gold are pinned on this year. "I really want it. I want it more than anything," she said. "To have the opportunity to go out there and give it full force and give it everything I've got, I'm looking forward to it more than anything." 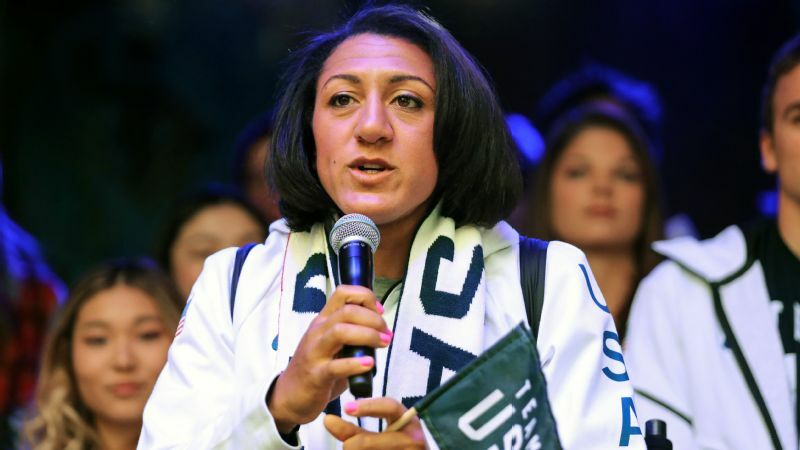 Meyers Taylor also wants to create more opportunities for female athletes. After the Vancouver Olympics, she convinced the USA Bobsled and Skeleton Federation to give her an internship to recruit new athletes. She has kept recruiting ever since. Her biggest aspiration is to get the four-woman bobsled added to the Olympics. "Right now, women just have the one opportunity," she said. "Every four years comes down to a mile of ice, hundredths of a second and just one shot. Men have two opportunities. Shouldn't we be able to have more, too?"